One could ponder what the dangers could possibly be of a drug that is made from a pretty little flower and used medicinally to treat severe pain. How can anything that can make someone comfortable be so bad? The quick answer is that opioids claimed the lives of nearly 35,000 Americans last year and the number has more than tripled since 2002. 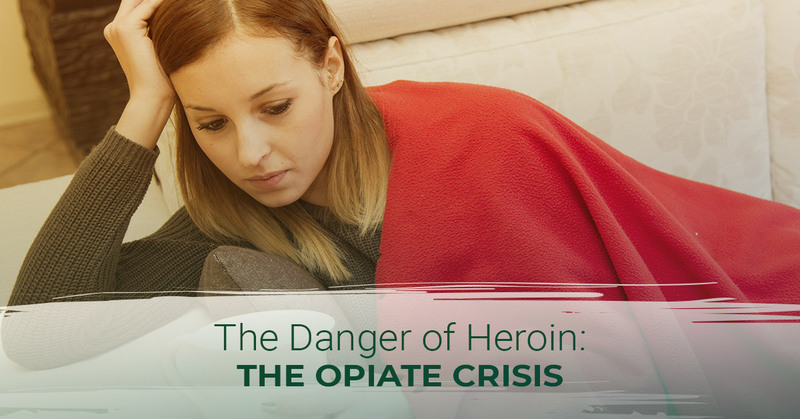 Heroin, an illegal and very dangerous form of opium, accounts for nearly half of the opioid induced deaths. Here, we will discuss what heroin is, why so many people have fallen victim to the drug, the dangers associated with the drug, and what is being done to solve the opiate crisis. Heroin is created from the milky, sap-like opium resin of poppy plants. The opium is chemically altered to form morphine and then further refined to make different forms of heroin. As long ago as ancient Greek and Roman times, doctors realized the power of opium as a powerful pain reliever and sleep aid. In 15th century China, opium was being smoked recreationally to induce a peaceful, sedated state. By the mid 1800s, opium addiction was a major problem, the solution was a less potent, non-addictive drug —morphine. As researchers would discover, morphine is actually more addictive than opium, but is incredibly effective for severe pain because of the effects on the pain receptors in the brain, and to this day is still the gold standard for severe pain relief treatment. Other prescription pain relievers such as codeine and oxycodone are similar in that they are derived from opium as well. By the late 1800s, it was clear that there was a definite morphine addiction problem, and so in 1898 Bayer pharmaceutical company released heroin to the market as an effective treatment for morphine addiction and tuberculosis. It only took a few short years to discover that heroin was so much more addictive than morphine and caused more violent withdrawals, so addiction was much more severe and quick. In 1924, heroin was outlawed due to its high rates of abuse and overdose-related deaths. In 1947, methadone was released as the answer to heroin addiction. Today, heroin is made illegally from harvested opium poppy plants and is available in a white to brown powder (color is determined by additives) or a black, sticky substance known as Mexican black tar heroin. Street heroin is rarely pure and includes fillers such as sugar, starch powder, powdered milk, or other drugs. Heroin is commonly mixed with crack cocaine, called speedballing. Heroin can be smoked, snorted, or injected under the skin, into the muscle, or into a vein. Why do so many people use heroin? Heroin, like any other drug, is used and abused because of the feelings the drug elicits. Heroin causes significant, intense, immediate pleasurable feelings known as the rush. The rush, or high, is a surge of enjoyable feelings including the immediate relief of physical and emotional pain; decreased anxiety; a warm, calm feeling; heavy, slowed physical feeling and an overwhelming sense of well-being and confidence. Because heroin works directly on the neurotransmitters in the brain, the effects are incredibly powerful. The perceptions for the user are altered and they are completely unaware of any alternative, which makes the high an enjoyable experience, especially for those with painful lives. While the decision to use heroin may be a conscious, voluntary choice the first time, it is incredibly addictive. In fact, nearly 25 percent of people who try heroin, even once, will become addicted. In addition to the rapid chemical addictive quality, the hangover or withdrawal associated with discontinued heroin use, even the first time, is just as intense and severe as the high was and include agitation and rage, widespread pain in the bones and muscles, insomnia, vomiting and diarrhea, cold sweats, involuntary body jerking, and intense craving for more heroin. Because of the addictive qualities and the very unpleasant withdrawal symptoms, people continue to use heroin, even if that was not their intention. What are the dangers of heroin use? Once the initial rush of the drug passes, the user begins to experience a hangover which includes severe dry mouth, vomiting, and itching and flushing of the skin. It also causes slowed breathing, mental cloudiness, sedation, and hypothermia (a drop in body temperature). While no single one of these symptoms is a huge concern, depending on the degree, they can all be life-threatening, especially in less than ideal environments, or in combination. Continued heroin use permanently alters the brain and the user’s neuronal and hormonal system. Heroin use is associated with many unwanted social side effects, aside from the obvious legal trouble. When people use heroin, they are completely detached from the “real world” and unable to function as normal; this leads to difficulty in keeping a job or relationship. When users inject the heroin, it may result in contracting hepatitis B or C, HIV/AIDS, blood clots, necrotizing fasciitis (death of tissue exposed to caustic agents), Staph infections, and botulism —and those are if the heroin is pure! Other dangerous issues are caused by the additives or fillers that dealers use to cut with the drug. Opioids bind to specific receptor sites in the brain that are linked to pleasure and pain; this causes the body to release endorphins, giving the user a sensation of euphoria while pain is numbed. The opiates in heroin activates the receptor sites in the brain to a degree far greater than the body could ever do on its own. Without the drug, users cannot find experiences that compare the feelings of pure bliss and contentment that heroin offers, and thus feel a deep depression when they discontinue use. This depression can be long-term and finding true joy may be difficult for some. As an addict continues to use, the body quickly develops a tolerance, which requires the user to use higher quantities, higher potency, or multiple routes to achieve the same high. These bigger quantities can lead to dangerous levels of the drug in the user’s system and can easily lead to overdose. Because opiates are natural depressants, heroin slows breathing rates and causes slowed or irregular heart rhythms which can cause the user to suffer respiratory failure and death. The opiate crisis is not isolated to the homeless or the destitute as Hollywood may have you believing. Heroin use and addiction span across all demographic populations, indiscriminately. It is estimated that nearly 2.1 million Americans suffer from an opioid addiction, while approximately 948,000 of those are addicted to heroin. The problem is so widespread and severe that in 2017, the Department of Health and Human Services declared a public health emergency and focused attention on solving the problem. Knowledge is power. To help reduce the number of people trying heroin for the first time and to help people recognize the signs of Heroin use in their loved ones, massive public education campaigns focused on opioid use have been launched. While the main focus remains on abusing prescription medications, street Heroin education has gained national popularity, focused on preventing new users. To help reduce the deaths related to opiate overdose, the Good Samaritan Law allows someone to call 911 to get someone who has overdosed the medical attention they need without worrying about the potential legal consequences to themselves. For instance, if two users shoot up heroin together and one overdoses, the other can call 911 without fear of being arrested for using or being in possession of the heroin. The hope is that this will encourage more witnesses to call for help. Narcan is an opioid antagonist, meaning it competes with opioids at their receptor sites, essentially kicking the opioid out of the receptor site and preventing it from reattaching. One problem is that Narcan does not get rid of the opioid and it has a much shorter half life, meaning that once Narcan is administered, the user should be monitored for signs of relapse and treated again, if needed. Because of the national epidemic of opioid-caused overdoses and deaths, the 2015 American Heart Association’s guidelines for Basic Life Support added the use of Narcan in any person who suffered an unwitnessed loss of consciousness. That means that anyone who holds a current CPR card is trained to administer Narcan. First responders, firefighters, emergency medical personnel, and most law enforcement officers are all trained and carry Narcan. Narcan is even available by prescription in all 50 states and over-the-counter in 46 states so that family members of users or bystanders can assist in an overdose situation. Because of the widespread availability of illicit drugs, the Drug Enforcement Administration is continuing its efforts to chase the source and suppliers of dangerous drugs, while local law enforcement has shifted its efforts on those demanding the drugs —users. However, rather than filling up jail cells with over 900,000 opioid users, many state, city, and county courts have been offering treatment options to first time offenders. Drug treatment programs allow those who have fallen prey to the opioid crisis a chance to get clean and live a sober, productive life rather than perpetuate the vicious circle of drug use and criminal activity. Because more than half of those who are addicted to opioids are addicted to prescription painkillers, the medical community has ramped up research and reliance on alternative pain management methods. Alternative pain management methods include addressing the root source of pain rather than treating the symptom and non-medication modalities such as massage, acupuncture, hypnosis, chiropractic alignment, physical therapy, heat and cold, and pressure therapy, in addition to new medications. Federal regulations have placed tighter restrictions and controls on controlled substances and their prescriptions, creating penalties for physicians who prescribe them. To help those who do suffer from an opioid addiction, more access than ever to substance abuse treatment is available. Substance abuse treatments have also evolved from simple detoxification to full treatment centers that incorporate detoxing, counseling, and medication use to help control the symptoms of withdrawal. Medications such as methadone, buprenorphine, and naltrexone are effective at treating opioid abuse. Incorporating group and individual drug and mental health counseling helps the recovering addict find the root cause of their drug use and develop coping techniques that help prevent relapse. Heroin is a very dangerous drug, and affects every community. Because opioids are extremely addictive, there really is no such thing as “I’ll just try it once.” Unfortunately, the opioid crisis continues to claim more Americans every year. At Metropolitan Rehabilitation Center, we are doing our part in fighting back to save the Oak Park and Detroit communities from the clutches of the heroin crisis. If you or someone you love is suffering from an opioid addiction, contact us to find out about our treatment options. You are not alone and you can find joy again. Begin your path toward recovery today! ©2017 Metropolitan Rehabilitation Clinics, Inc.